This month it worked out a little better. I was too lazy to get out the tripod (it was cold! 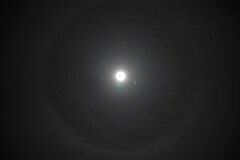 ), but I couldn't resist a photo of the moon with a halo/aura around it. I'm also too lazy to read up on how to take better photos of the moon, but I'm happy to just have the opportunity to try.